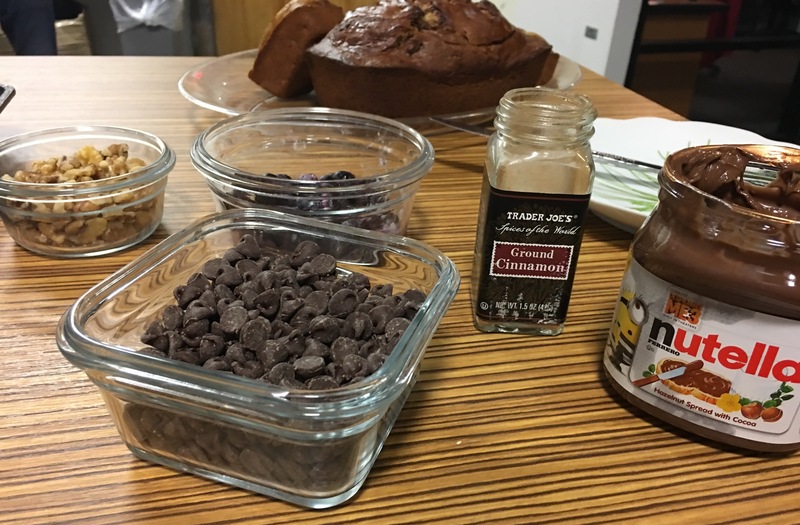 Banana Bread and WKRC Local 12 (video included) – Go There. Try That. A dear friend of mine just reminded me that the very first thing I ever made for her was my banana-chip bread. This made me smile. While banana bread is not bound to a particular season, to me, winter calls for warm banana bread. Whether you slice it and spread a little butter on top, serve it with a warm cup of coffee or a cold glass of milk, you can’t go wrong. 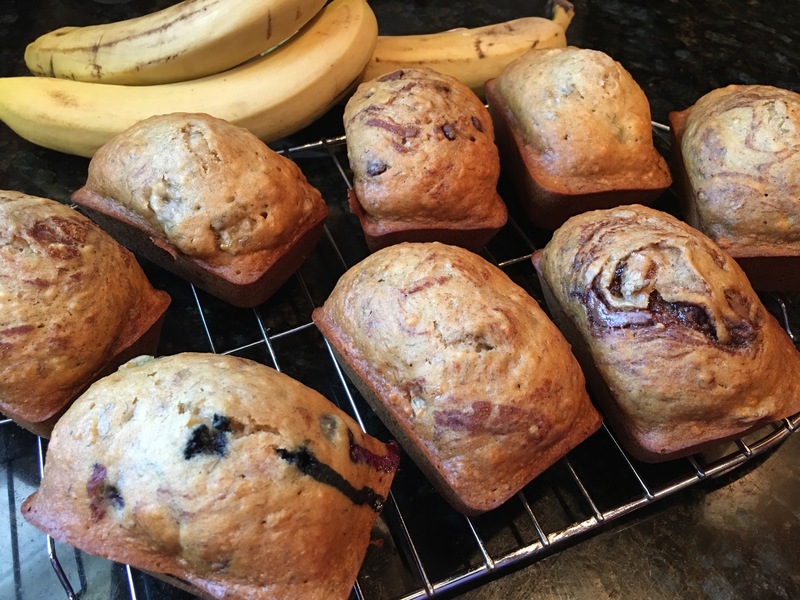 Banana bread is breakfast, afternoon snack, and evening treat. This is my go-to recipe because I love baking with honey (local honey if possible) rather than sugar. If you want to go even healthier, replace the oil with applesauce. Also, I’m messy enough in the kitchen, so I appreciate that this dish is pretty much whipped up in one bowl. I don’t need to fuss around with a bunch of dishes. Optional add-ins: ½ cup mix-ins like chopped walnuts or pecans, chocolate chips, blueberries, fresh banana slices, etc. Tip- If baking with blueberries or other fruit, toss in a bit of flour (this keeps them from sinking to the bottom). Optional toppings: Swirl a bit of nutella, peanut butter, or cinnamon on the top; not only does it look gorgeous, it tastes great. Getting ready to whisk it up! Get creative with your mix-in ingredients. Preheat oven to 325 degrees Fahrenheit and grease a 9×5-inch loaf pan or a mini loaf pan. Add the baking soda, vanilla, salt and cinnamon, and whisk to blend. Lastly, switch to a big spoon and stir in the flour, just until combined. If you’re adding any additional mix-ins, fold them in now. Pour the batter into your greased loaf pan and swirl in topping if desired. Bake for 55 to 60 minutes, or until a toothpick inserted into the center comes out clean. If you’ve added mix-ins, it will need a bit longer. Let the bread cool in the loaf pan for a few minutes before transferring to a wire rack for cooling. A couple years ago I purchased an 8-cavity mini loaf pan and it’s totally changed my bread game. First of all, if you’re being good, it’s a single serving (if it’s more than a single serving, let me live in denial please). Secondly, these mini loaves make perfect pick-me-ups for friends, family, and coworkers. Lastly, I like experimenting with mix-ins and toppings. For example, in this batch, I had two blueberry banana (topped with sugar crystals), two banana nut, two banana chip (topped with a nutella swirl), and two regular (topped with a cinnamon swirl). 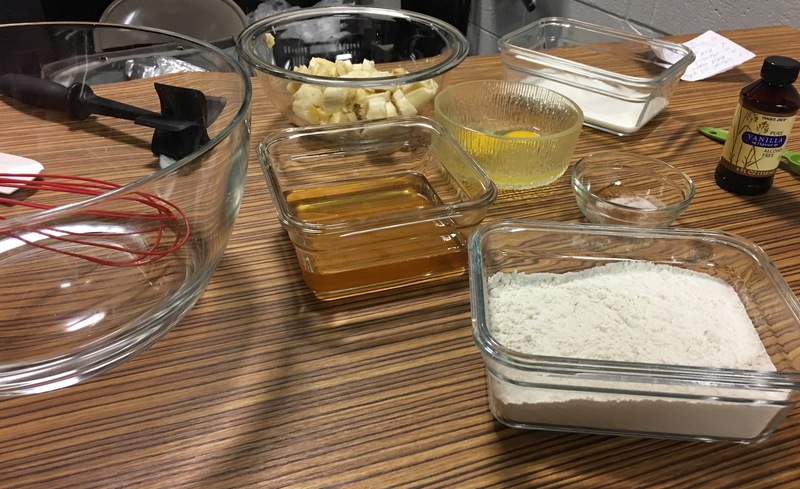 Making banana bread on WKRC local 12. If you’re feeling really fancy, bag up your individual mini loaves, add a cute label. . . maybe some ribbon, and deliver! Mr. Chippy. Mr. Berry. Mr. Nutty. 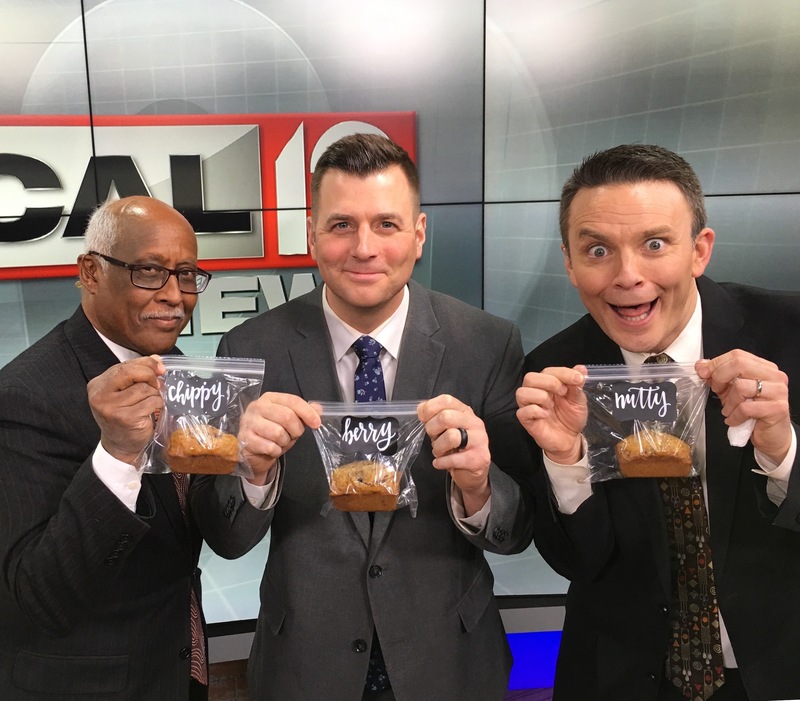 Check out Bob Herzog and John Lomax whisking up some bread with me in the studio at WKRC 12! The video is below. 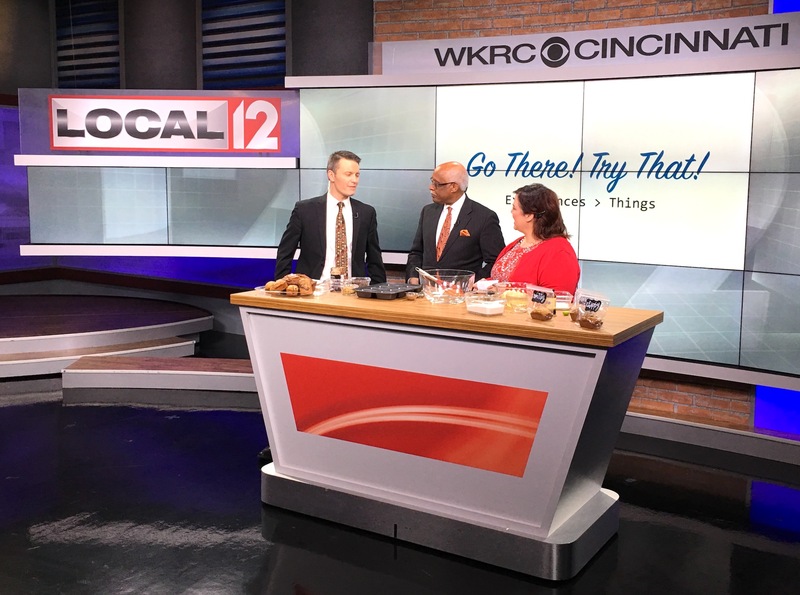 GO THERE (WKRC local 12, the kitchen)! TRY THAT (banana bread, mini loaves, baking for others)! Thank you so much! It is fun. I miss seeing you!